The Rutgers University Programming Association (RUPA) is the university-wide student programming council that serves the entire Rutgers community. We strive to do this by providing a variety of events appealing to the diverse student body on all five campuses. Examples include concerts and comedy shows with internationally known artists, the Annual Homecoming Charity Bed Races, entertaining lectures and performances, art projects, and much more. RUPA was founded in 2007 by combining the programming boards from the then-individual colleges and is now the sole programming association at Rutgers University-New Brunswick. We are a group of 30–40 undergraduate students with a passion for programming, marketing, and leadership focused on providing out-of-classroom experiences for all Rutgers students. While we know we can’t please everyone all the time, we strive to provide events where all students can find something they are interested in at least once per semester. We are always looking to improve our organization and our programs so we value feedback from others and appreciate suggestions from our peers. Q: How does RUPA pick the artists/lectures/comedians that come to Rutgers? A: Individual committees begin brainstorming potential artists while adhering to constraints specific to the budget, previous genres/events and Rutgers’ diverse student interests. After reaching this initial decision, the event is proposed to all of council for additional insight and feedback. To further ensure a positive experience for the University community, an artist vetting process ensues. This additional process consists of contacting previous venues where this artist has performed for a more confident understanding of the event’s success at Rutgers. If at any stage there is doubt of the artist’s benefit to students, the process restarts. Q: Do the students of Rutgers have any say in who or what comes to Rutgers, or do you guys just pick what you want? A: We go through a program proposal process where our 30-40 council members brainstorm and generate program ideas based on our own interests and the ideas we gather through talking to our peers and friends, conducting focus groups, benchmarking with other universities, and identifying current trends. We accept requests and ideas from anyone and take them into consideration based on budget, demand, and feasibility. If you are interested in sharing ideas or feedback, please attend one of our biweekly RUPA Interest Meetings to share your input in-person or submit an online suggestion here. Q: There’s an awesome event that I would LOVE to attend, but it’s all the way on Douglass! Why can’t the event be here on Livingston? A: RUPA strives on providing experiences for all students here at Rutgers University on all campuses. We strategically locate our events at varying campus locations to target different audiences and to meet the programmatic needs of our events since some events require spaces that are better suited on specific campuses and certain campus locations may not be free on the date of our event. While we program on all five campuses and know that requires you to travel to attend our events, we do work very hard to provide a variety of programs on different days of the week and different times of the day so that you have opportunities regardless of your class schedule, residence location, and other factors. Q: Why can’t we have more concerts instead of having a big comedy show? A: RUPA is committed to providing a wide variety of programs that will appeal to many different student interests. This simply means that it is necessary to program different events for students with different interests to enjoy. While you may prefer concerts over comedy, there are many students who feel differently. We allocate our funding across our committees to ensure that we are providing a wide sampling of programs including everything from lectures and trips to crafts and outdoor festivals. Q: Why can’t you save money by cancelling other small events in order to bring bigger artists/comedians/lectures to Rutgers? A: Our smaller events are just as important to certain students as the big concert or comedy show may be to you. We like to be present on campus as much as we can instead of only being around three or four times a year. We want to make Rutgers fun all the time and since our goal is to provide multiple opportunities for students to enjoy their time out of the classroom, we remain committed to programming several times a week throughout the entire academic year. Q: If RUPA’s budget is so big, why can’t we afford to bring bigger-name artists or speakers to our school? A: Part of RUPA’s mission statement is to bring a variety of events appealing to the diverse student body here at Rutgers University. 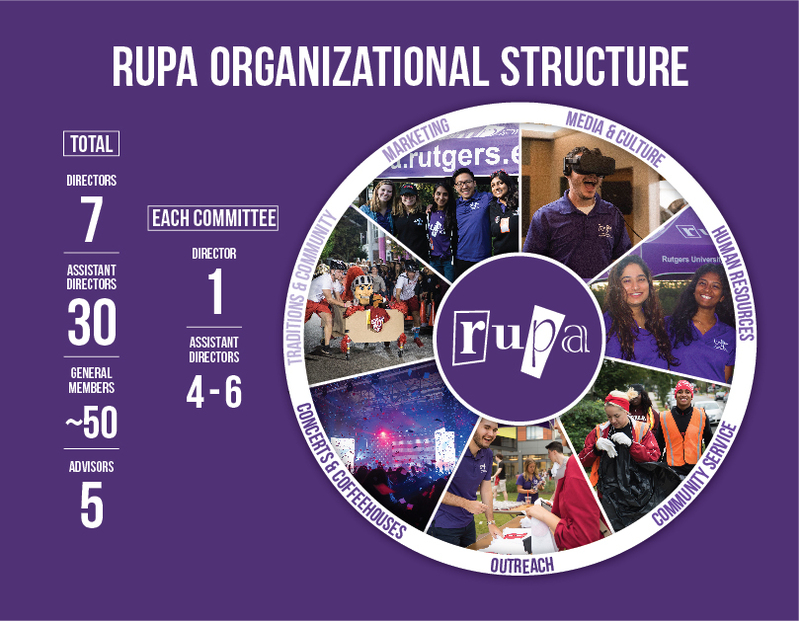 Therefore, RUPA’s organizational funding is divided and allocated among seven different committees and about 150+ events per year, in hopes of meeting the different interests and needs of all Rutgers students. Although we can’t please everybody, we always strive to have something for everyone at least once per semester. It’s also important to note that while RUPA has a significant budget, costs for artist fees, production and security for large concerts and comedy shows already comprise more than a third of our annual allocation and if increased, would make it impossible for us to offer the number and variety of programs that we offer each year. Q: Why doesn’t RUPA just charge higher ticket prices for bigger concerts to bring better artists here? A: RUPA’s goal is to make all of our events as affordable and easily accessible as possible. Although most of our smaller-scaled events are free, we subsidize the prices for ticketed events to allow every student an opportunity to attend, even those who have financial limitations. This applies to not only our concerts, but to our comedy shows, sporting events, and broadway trips as well. RUPA also works to assess previous programs and seeks feedback for upcoming events so that we have a good understanding of how much students are willing to pay for ticketed events on campus. We want to be sure that when we spend money to bring well-known artists to campus that we will sell the maximum number of tickets. Q: Am I paying for the events that RUPA programs? A: Of the student fee, RUPA receives a direct allocation of $3.75 per semester per Rutgers University – New Brunswick full-time student. This provides approximately 30% of our total budget of $815,000. The remaining $522,000 of our budget comes from the Division of Student Affairs generated revenue, garnered from things like food sales and room/equipment rentals at student centers. Q: Since RUPA has such a large budget, why do we have to pay for some events? Why can’t all events be free, especially since some of the money comes from my student fees? A: With the exception of Poster Sales, we never profit on our events. We only charge for trips off-campus and our larger comedy shows and concerts. We budget for these events so that while we charge a ticket fee, it is highly subsidized and we are able to provide a much lower price through RUPA than what you would pay if traveling on your own or attending an event at a different venue. Q: Why does RUPA take my money and then program events I don’t even like? A: We know it is impossible to please everybody all of the time, but we are sorry that you have not enjoyed any of our programs. We would love to hear from you at one of our bi-weekly RUPA Interest Meetings or through our online suggestion box, because our goal is to create diverse programs that each student can enjoy at least once per year and your feedback will help. Q: Will RutgersFest ever come back again to Rutgers? If not, what happened to the money allocated specifically for it? A: Unfortunately, due to post-event violence as well as University and municipal safety requirements, the event has been cancelled by University administration. The initial $150,000 budget for the event has been reallocated internally amongst the committees to meet student needs for diverse campus programming, including Beats on the Banks, held in the fall and spring semester in the College Ave Gym. Q: How is RUPA organized? What positions are there? How can I get involved right now? A: RUPA Council consists of about 30 Assistant Directors assigned to specific committees responsible for programming and staffing our 150 events throughout the year. Our Executive Board of Directors consists of seven students responsible for managing a specific committee and furthering RUPA’s mission on a broader level. We also have opportunities for any student to become a General Member by coming to one of our bi-weekly RUPA Interest Meetings and volunteering at events. In February each year we recruit and select the new Council for the following year. The RUPA selection process is managed by our Human Resources committee and consists of an initial application followed by an interview for both the Assistant Director and Director positions. Candidates are evaluated on their interview by non-returning or graduating RUPA Council members, as well as our professional staff advisors. Q: Who has the opportunity to be a part of Council? Do I need to be a General Member to be able to become an Assistant Director? A: Being a RUPA General Member is not a prerequisite for applying for the Assistant Director position. However, we encourage you to attend our bi-weekly RUPA Interest Meetings to further your understanding of our organization and determine if this opportunity truly matches up with what you are looking for. Q: Will my chances to be on council increase if I’m a General Member? A: We consider all students equally in our selection process, but serving as a General Member allows you to experience RUPA as an organization without the time commitment required to serve on Council. It may also further your understanding of our organization, which could aid in the interview process. Serving as a volunteer at our events also allows RUPA Council members an opportunity to see your abilities in that role and allows you an opportunity to determine if you really do enjoy the work required to be successful in RUPA. Q: Is being on RUPA Council a paid position or is it volunteer? A: Being on RUPA is a volunteer position, but we do provide a stipend for the seven Directors for their work over the summer. The Directors work approximately 30 hours a week staffing New Student Orientation (NSO) resource fairs and socials, attending Executive meetings twice a week with Directors and Advisors, and holding office hours to program events and finalize details for the upcoming fall semester. A $2,000 per student stipend is awarded to offset the time commitment required for their summer work. This summer schedule concludes the third week in August and Directors revert back to volunteer status when we go on retreat the second to last weekend in August with the rest of Council. Q: Why does each RUPA Director get paid an RU Express gift card each month? A: RUPA Directors receive four $50 RU Express monthly stipends respectively per semester to compensate them for their commitment to staffing multiple events and meetings each week. In addition to mandatory office hours, our events often go very late into the evening and this card is used most often for food when Directors are unable to eat at home or in the Dining Halls.